Mineral zinc perhaps the most ubiquitous and versatile of all metal cofactors. Zinc- binding proteins that engage DNA, the so called zinc finger proteins, attest to the versatility of zinc in biological systems. 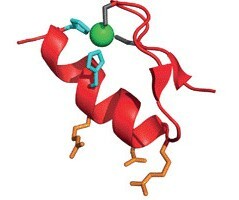 Zinc fingers may have evolved originally from peptides, which maintained a simple ββα structure independently of zinc. Zinc fingers are abundant in nature and the huge variety found in various organisms, from yeast to human, may in part be due to their modular nature. Approximately 3% of the genome of mammals codes for zinc finger protein. In zinc finger proteins, Zn2+ contributes of the stability of the loop structure that contracts the major and minor grooves of DNA. The majority of zinc fingers fall into three fold groups: the C2H2-like zinc finger, the treble clef zinc finger and the zinc ribbon.